Black Residents in Jasper, TX are stepping up and speaking out against CNN and the New York Times. The former Police Chief, Rodney Pearson, was fired and the City Council members who hired him were recalled. Pearson is black and says he was fired because of his race even though he was fired because of, among other things, his low qualifications, low performance, and a criminal record. 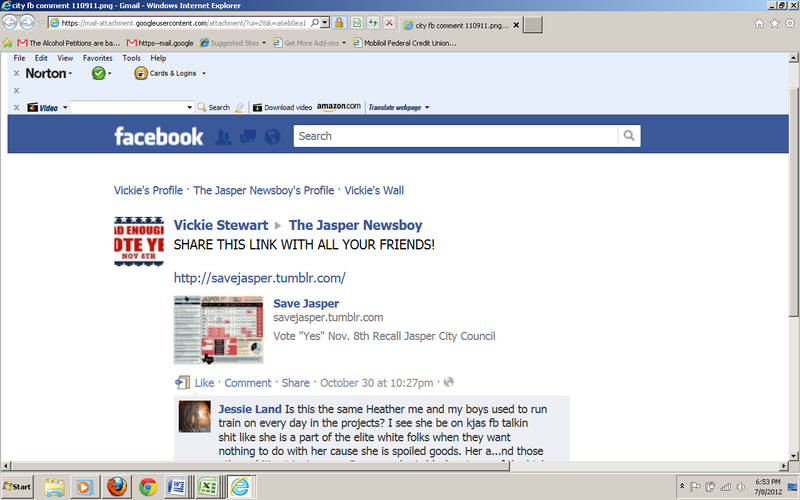 The liberal media gets contacted by Pearson's race-baiting lawyer and next thing you know there are stories on CNN and the New York Timesalleging that the white people in Jasper are racist and did not want a black person in a leadership position in this city. When Pearson was fired, I wrote an article predicting that the race card would be pulled and I sure was right. 1) These media outlets try to make it appear as though only whites were against the hiring of black Police Chief Rodney Pearson when in reality there were MANY vocal black residents who were against the hiring of Pearson and who supported the recall of the black Council members for hiring Pearson based on race and not qualifications. These liberal news outlets purposely did not interview the black residents who were for the firing of Pearson and for the recall of the Council members because that would not fit into their story of racism. One Jasper resident who I interviewed over the phone, Michael Larkin, is a black local businessman, and he opposed Pearson as Police Chief. Larkin was even physically threatened and had his business threatened by a small group of black pastors and supporters of Pearson because Larkin was black and was opposing the black Police Chief. One black pastor who went to Larkin and threatened him is Mr. Norsworthy, the husband of one of the recalled Council members. Larkin stood his ground and said that he supports people based on qualifications and not race. Funny how those little details did not make it into the liberal news stories. I did talk to Larkin though and Larkin had many interesting things to say. You can read more of what Larkin had to say by scrolling down further in this article. These liberal media outlets clearly missed the ball here. 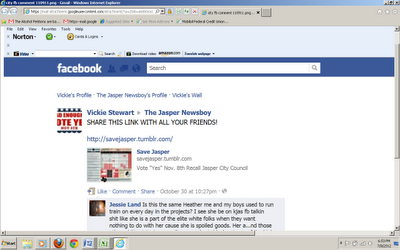 If they reported the whole truth they would know this is not about white people in Jasper not wanting a black leader. The firing and recall are clearly about these Council members being held responsible by the voters for hiring a bad Police Chief with a criminal record. 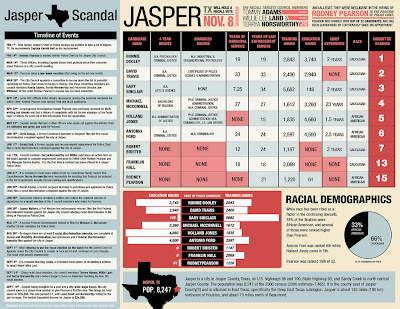 In fact, the media also does not point out that the majority of the population in Jasper is black so it HAD to have taken black people voting against Pearson and these Council members for them to be removed. 3) The New York Times started out their story by talking about a supposedly segregated cemetery in Jasper as proof of past and current racism in Jasper. Well, two black funeral home directors in Jasper say that the New York Times article about segregated cemeteries and a fence separating black and whites is a bunch of lies! Funny that the New York Times did not interview the black-owned funeral homes or black funeral directors when writing their story about where people get buried in Jasper. KJAS however DID interview these black funeral home directors. These black directors say that the New York Times article is wrong. You can read some of the comments from these black funeral home directors by scrolling further down in this article. 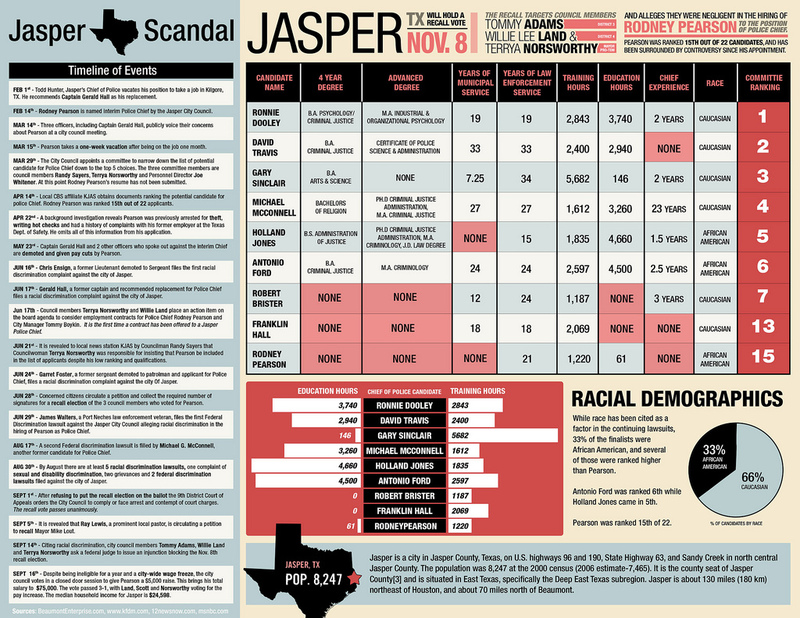 5) The media does not seem to care about the several lawsuits that have been filed against the City of Jasper by more qualified white candidates who say they were discriminated against when the black members of the former City Council hired Pearson based on race. The media did not mention the fact that there are lawsuits against the city from white officers who were fired or demoted as soon as Pearson became the Police Chief. If any racism or discrimination did occur in this situation in Jasper, it was discrimination against the several well-qualified applicants and officers who were fired or passed over so that a less-qualified Pearson could be picked in a backroom deal. Some media outlets do not even mention these many lawsuits in their story and some only gave a sentence or two mentioning the white lawsuits, but then using the rest of the entire article to talk about the one discrimination lawsuit filed by Pearson. 6) The media lied about Pearson's involvement in the James Byrd Jr. dragging investigation to try to tie that dragging into this story. The media had to somehow try to emotionally connect the firing of Pearson to the dragging of James Byrd Jr. 14 years ago. Not only is it wrong to try to connect this firing with the horrendous murder by random individuals who have since been convicted; some of them have even been put to death already. Yet Pearson and the papers try to make that connection. They have to lie, though, just to even make their story look good. The New York Times says that Pearson, then a state trooper, was the first law enforcement officer at the scene of Mr. Byrd’s killing and found his body. This is false. According to the Sheriff’s Department Dispatcher Alice Rector Duckworth who took the call the day of the James Byrd Jr murder: “Rodney Pearson had NOTHING to do with finding his body as this newscast would have you believe. 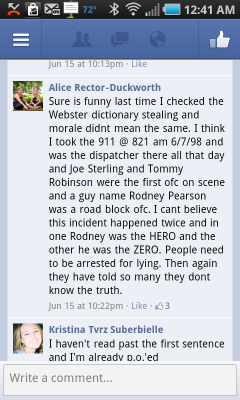 The first responders were Joe Sterling, Tommy Robinson, and the late Sam Sanders. 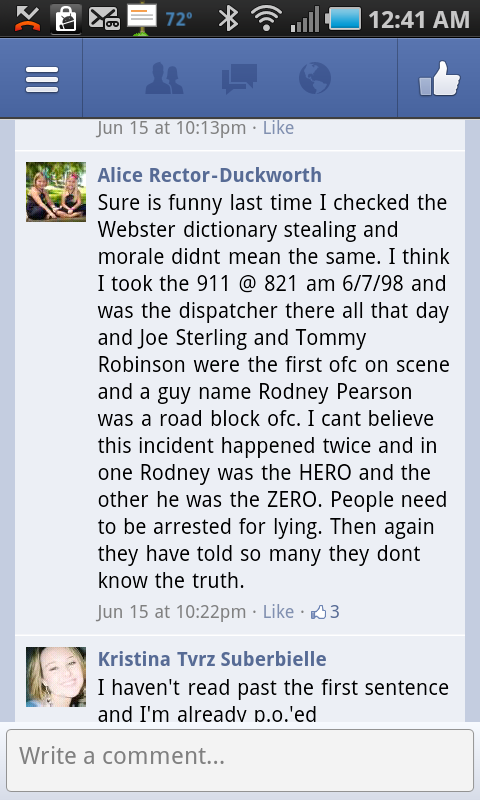 Rodney was nothing but a road block cop. It had nothing to do with 'highway patrol duties'; it was a murder not a wreck.” Pearson and his attorneys are lying and sensationalizing the Byrd murder to perpetuate their own legal endeavors. 7) The media had no problem mentioning a couple of random comments on Facebook to make the people against Pearson look racist, and yet they ignore the racists and threatening posts on Facebook by pro-Pearson individuals, like Jessie Land, talking about "running a train" over a woman who wanted Pearson fired (see Facebook screenshot further down in this article). They also ignored the detail of the statement made at a City Council meeting saying that the city needs a black Police Chief so they have to hire Pearson. Pearson did not even met the minimum requirements for the job. THE BASIC JOB REQUIREMENTS POSTED BY THE CITY OF JASPER 02/17/11: BACHELORS DEGREE IN CRIMINAL JUSTICE OR 7 + YEARS EXPERIENCE IN MANAGEMENT OF POLICE PERSONNEL AND RELATED DUTIES - PEARSON HAD NEITHER! The top applicant had 19 years municipal experience/Pearson NONE, top applicant 3740 education hours/Pearson 61, top applicant 2843 training hours/Pearson 1220, top applicant 4-year degree/Pearson NONE, top applicant advanced degree/Pearson NONE. Pearson took two or more vacations in his first year (policy/procedure requires one year employment to qualify for vacation), removed a brand new patrol vehicle from the streets had it re-painted and accessorized for him to drive without approval, leaving our city short a patrol vehicle, had excessive spending/was over budget, demoted seasoned officers without reason. Pearson did not even bother to show up at major crime investigations that the Police Chief of the city should have shown up to. Larkin is a black business man in Jasper, TX who not only opposed Pearson as as unqualified Police Chief, but he also was in favor of recalling the black Council members who hired Pearson. Larkin was even threatened for having a recall sign on his property. Did CNN or the New York Times care to call this man? No. This interview would not fit into their story of only white people opposing Pearson and the council members. "When the preachers won't do right, what can we expect for the other people to do?" What that newspaper is saying is incorrect, and you can tell that reporter to call me and I’ll tell him”. Those were the words of Dory Coleman, owner of Coleman’s Mortuary in Jasper, which traditionally serves the African American community.